If you have got yourself a good hardtail mountain bike, then you might be ready to take it out and hit the trails. But before you do that, it is a good idea to get yourself outfitted with a decent bike helmet to protect your noggin. Even if you think that you’re super careful and will not take a spill while you’re out on your mtb, do yourself a favor and get a helmet anyways. If you do a fair amount of riding out on the trails, then taking a fall is inevitable – and when it happens you do not want to get your head all banged up just because you thought that you didn’t need a helmet. I have seen some pretty gnarly accidents where mtbers were not wearing helmets cause they either thought they were too skilled or that they were going to take it slow and careful. That is how you end up in the hospital with a concussion like my mother-in-law! Now that you (hopefully) understand why a helmet is so important for you to wear on your rides, let me help you find the best one for your head. The most important thing is that you MUST get yourself a helmet that offers a good fit for your head. Since everyone’s head is different, what works best for one cyclist will not be the best option for the next. So, that is something to keep in mind when taking recommendations from other bikers. And, you probably cannot share a helmet with a family member because the likelihood that you both have the same exact head shape is pretty slim, so don’t cheap out and try that. With so many great mtb helmets under $50 – $100, you can easily afford to get a helmet for each family member. As for the fit, it needs to be comfortable on your head and fit the shape of your head. You also want to go with a helmet that gives you a snug fit without being so tight that it is uncomfortable to wear on your rides. As you check out different brands and models of helmets, you will notice that they are all shaped differently. Some of them are rounded while others have are more oval-like shape. You have got to try on a helmet to know if it fits you well or not. Yes, you can almost always find the helmets at a much cheaper discounted price online. This means that you can either try it on in a local store and the order it online from home or buy a few different options from an online store like REI that offers free returns and then just send back the ones that don’t fit. 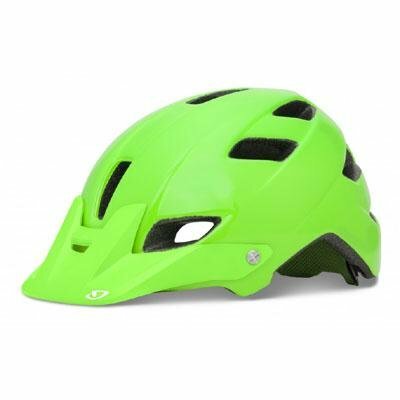 So, find some helmets that are in your price range and fit the shape of your head and give them a try. Once you get a helmet on and get the retention system all in place, give your head a firm shake about. When you do this, the helmet should not move if it is a proper fit for you. If it moves, then you need to try a different helmet. An important thing to keep in mind is that this helmet is going to be protecting some precious cargo – your head! And, a decent mtb helmet should last you anywhere between seven to nine years under most conditions. So, do not try to cheap out just to save a buck or two. Sure, there are some cheap mtb helmets that offer great protection and you can certainly get one of those but avoid buying cheap if the quality is not there. And once you actually get your helmet – remember to wear it when you go out riding and you have got to use the straps to keep it on your head, otherwise it is completely useless. 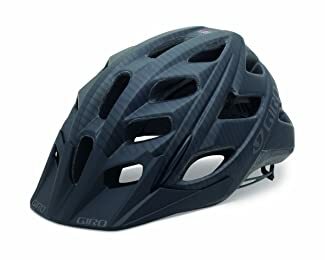 To help you find some of the top mountain bike helmets for they money, I want to share some of the best mtb helmets that either my friends and family use or that I use when out on my bike. Though not all of the helmets below are ones that I have personally used, I only included those that I know to be quality mtb gear based on what others have told me. So, use the reviews below as a good starting point for finding your own mtb helmet. 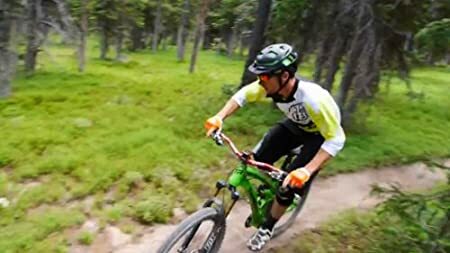 If you are looking for a good mountain bike helmet under $100, then this is definitely a good option to consider if the cost fits your budget. 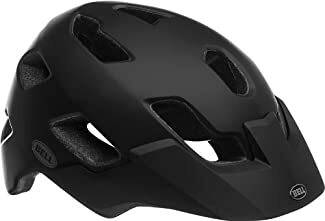 I like this helmet because it is basic and cheap but is actually a quality product that I feel comfortable using to protect my head. It’s got the foam padding inside to cushion your head in case of a fall and it has some adjustable vents. The ventilation is important to me cause it is usually humid where I ride, so I get heated up quickly while out on the trails. It even has Coolmax pads which help with the sweating. This one also has a decent weight at around 11.1 oz, so it is not too heavy on the head. That makes it a good ultralight mountain biking helmet. I think this helmet offers a great value for the money as it is available in four different sizes, which means you get a better chance of finding a perfect fit. The aerodynamics are great, it is well-ventilated, offers a comfortable fit and is available in seven different color choices – great for both men and women. If you like to wear goggles when you’re out on your mountain bike, then know that this helmet is goggle-compatible. Overall, this is probably my top pick just because the price is low and it offers a lot value. Plus, this helmet seems to cover just a wee bit more of your head than other brands and models out there, and I like that extra protection. 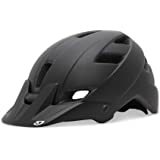 I strongly suggest that you consider this Bell Stoker mtb helmet and try it on in a local shop or order it from Amazon where you can easily return it if you don’t get a good fit from it. If you like the price of the Bell Stoker above, but don’t get a good fit from it, then give the Giro Feature mtb helmet a try. For me personally, I do not get a good fit from this one but I have a buddy who swears by it. Like the Bell Stoker, it is ultra lightweight and is ventilated, although not quite as much as the Bell Stoker. And, it has a nice low price. So if this is where your budget is, this helmet is a decent one to consider. Though you can see it comes in lime green in the photo, there are actually six other color options for you to choose from when you’re ready to buy. It has the foam EPS liner and a durable polycarbonate shell construction. But probably the best thing about this helmet is that it has an adjustable moto-style visor. You do not realize just how useful that is until you have it on a helmet. If you can spend a little more money on your mtb helmet, then consider this Giro Hex model. 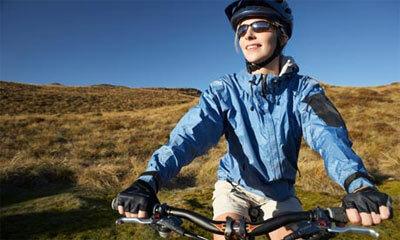 I think that it is one of the best choices when it comes to affordable mountain bike helmets. You really can’t be the value for your money that you get with this helmet. And people who are picky about the color of their gear will like that you have around 15 different color choices to choose from in this model. That makes this a great choice for both men and women. It has a nice, rugged design that features 21 wind-scooping vents. This means that your head will stay cool when you’re out in the heat and humidity. The ventilation here really beats the models listed above in terms of air flow. Probably the best feature that this helmet has though is the Roc Loc 5 fit system. You get some seriously secure straps that ensures everything stays in its proper place in the case of taking a fall or a header into a tree. And, with this strap system, making adjustments to the tightness of the straps is super easy, which is perfect for those times when you want to loosen it a bit when you’re no longer on rough terrain. Those mtbers concerned about helmet weight will love that the Giro Hex is super lightweight at only 10.1 ounces. The bottom line here is that you get a quality helmet that is comfortable and offers a lot of protection if you want to spend just a little more than the Bell Stoker or Giro Feature. Definitely something to consider adding to your gear.